Our Springfield dental team is committed to providing our patients with the most pleasant experience possible. At Innovative Dental, our experienced dentists, believe in creating bright and healthy smiles through advanced treatments and innovative techniques. 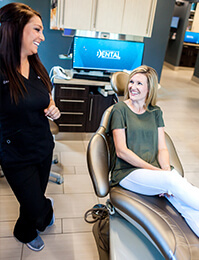 We also know that going to the dentist can cause anxiety for many people, so we strive to do everything possible to create a warm, inviting, and comfortable atmosphere. 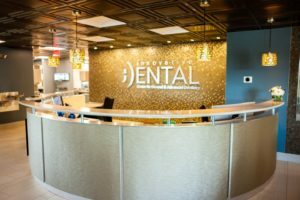 We offer a modern approach to dental care, an experienced and knowledgeable team, and amenities such as TiVo, iPads, headphones, massage chairs and a cappuccino machine for your enjoyment. Walked into the office and was immediently shocked at how advanced the office is compared to most dentist offices. The x-ray machine is digital and doesn’t put off radiation (no heavy bib needed) as one example. The staff was friendly and kind as well. We have a conference room with a 100+ inch 4K (4 times HD) screen to help better educate you on our procedures, as well as for you to review your treatment plan with family members. We aim to provide “Innovative” care all around, such as Innovative Restore, Innovative Cosmetics, and Innovative Invisalign®, using the most advanced technology. Whenever possible, we like to complete procedures in a single-visit. We believe that using the latest technology allows us to create a quicker, more efficient, and overall better dental experience. If you are interested in learning more about our practice or any of the procedures we provide, or if you would like to schedule a consultation, please contact us today. Simply contact us by phone or text at (417) 889-4746 or use our contact form. Dental problems don’t always happen during normal business hours. Please call the office during business hours, otherwise you may call Dr. Olson’s personal cell at (417) 343-1266. Should you require emergency dental service, please contact our office and follow the prompts. One of our dentists will be happy to answer or return your call as soon as possible. If you take special care of your teeth and they are in good condition, you should come to see us for a checkup at least twice a year. If your teeth are predisposed to problems, you should be on the safe side and make an appointment for preventative care regularly. Innovative Dental recommends a first dentist visit somewhere in the third year. Establishing regular visits at a young age has proven to improve the health and stability of adult teeth and better prepare your child to be comfortable at the dentist office. If you would like to learn more about our practice, or if you would like to meet with Dr. Olson or Dr. Megan, please contact us today. I now have a beautiful smile and feel more comfortable smiling. I was so surprised how fast my teeth were straightened! Thank you so much Innovative Dental!